After two tough games against Cullyhanna, Armagh Harps faced stiff opposition against Ballymacnab in the first of this year’s semi finals, which they overcame to reach their third SFC Final in four seasons. Their ability to efficiently counter attack at speed provided 9 of their 14 scores. As they turned defence into attack with 26 turnovers throughout the 60 minutes. It was the Harps who opened the scoring straight from the throw in, Josh Loughran drove forward from midfield to kick the ball between the posts. Rory Grugan quickly levelled the score with a free kick before a great save from Ballymacnab’s keeper; Conor McGivern, denied Tommy Turley a certain goal. Ballymacnab nudged themselves ahead soon after with Paul Kennedy opening his account. Before the score was level once more with Ultan Lennon getting his first to make it 2 all. After Josh Loughran had won his sides kick out. 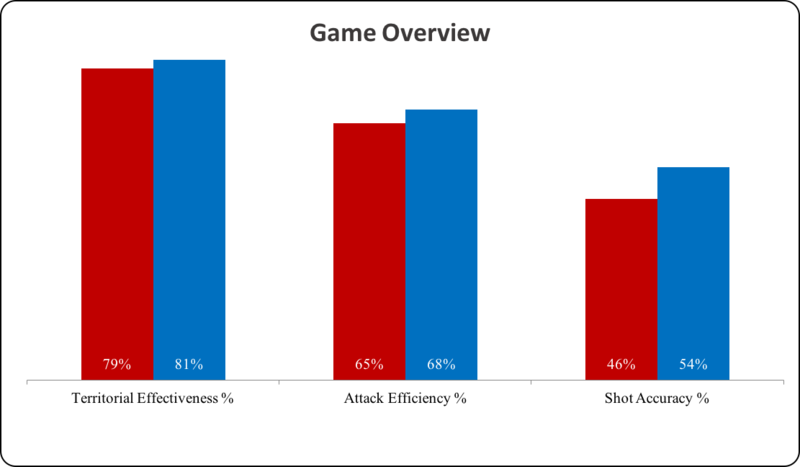 Ballymacnab shooting had let them down in the opening 10 minutes, converting just 40% of their 5 shots. Ryan Kennedy was then on targeted to edge the Nab ahead once again, an attack started from a Michael Beagan turnover in his sides defence. The game was really point for point at this stage as Gareth Swift levelled for the Harps, with Charlie Vernon’s driving run through the defence setting up Swifts equaliser. The Harps were next to lead on the score board when a turnover by Joe McElroy set up Declan McKenna who expertly drove the ball over the bar with the outside of his left foot. 2 of the 4 Harps points coming as results of turnovers. Their lead was short lived however as a wonderful Jack Grugan free drew the game at 4 points apiece. Harps were once again deprived of a goal by the reflexes of McGivern, but did earn a free which Swift duly tapped over. Another Harps attack was turned over 2 minutes later. This time by Pauric Gribben, providing the counter attack for Rory Grugan to level the game, after a great pass by Michael Beagan. Swift once again put his side in front with a free after good work from Ryan McShane who won the break ball from Paddy Morrison’s kick out and drew a free. Ballymacnab’s top marksman Rory Grugan split the posts once more from the dead ball with Ryan Kennedy driving forward after collecting the Nabs restart. This left the game level at 6 points each at the half time break, with it all to play for in the second 30 minutes. 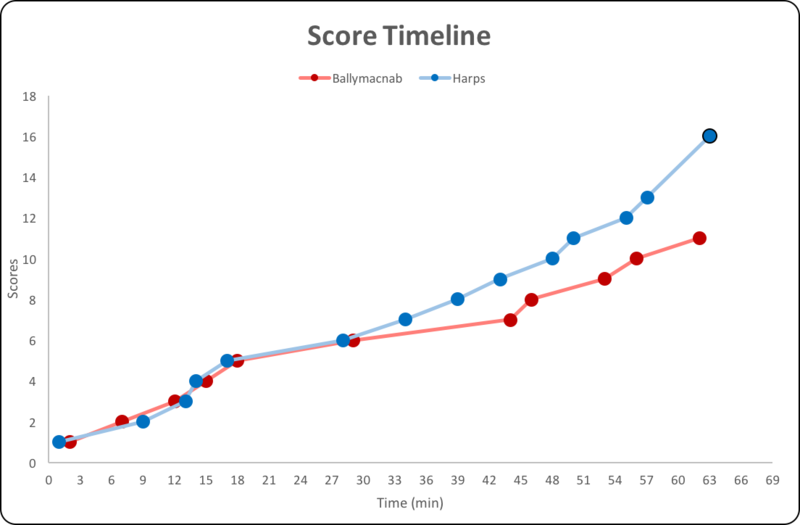 Ballymacnab’s best chance of scoring came from turnovers. 50% of their total coming as a result of winning the ball back. They turned the Harps over 16 times throughout the half, with 11 of these coming in their own defensive third. This provided them with an opportunity to attack, which they did 22 times. However out of their 14 shots they converted just 43%, kicking 7 wides and dropping 1 shot short. The Harps likewise scored 3 points as a result of turnovers. However they also got 2 points from their own kickouts, winning 9 out of their 13 restarts in the first half. 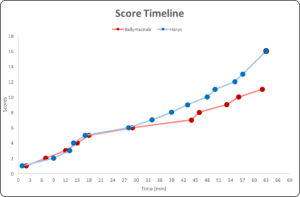 The Harps had fewer shots than their opponents, but had a better accuracy return, kicking 50% of their shots over the bar. Whilst kicking just 2 wides and 2 short from their 19 attacks. Harps substitute Tom O’Kane, introduced at half time, took just 2 minutes to get his name on the score sheet after Swift led the ball off to him. However, this would be Swifts last positive contribution as an off the ball incident seen him sent to the line with a straight red card. Leaving Ballymacnab with a 1 man advantage for the remaining 25 minutes of the game. This didn’t seem to upset the Harps momentum however, as they kicked the next 2 scores. Both coming from Joe McElroy to put his side 3 points to the good. It took Ballymacnab 12 minutes to register a score with Rory Grugan on form once again. It was Grugan with another point from a free which dragged his team back to within 1 point. The margin was soon doubled when O’Kane was on target for his second score, after a Ballymacnab attack had broken down. The lead was then extended to 3 when Declan McKenna broke forward from his centre half back position to beautifully split the posts for the second time in the game. Rory Grugan yet again drove his team on with another fine score after a Ciaran Connelly turnover. But it was the Harps who got the next point, when Simon McCoy was fouled after winning a turnover in his teams attacking third. Conor Murphy stroked over the resulting free. Ballymacnab once more could only get to within 2 points of the eventual victors with a Brian McCone free while McKenna’s third of the evening left the score 0-10 to 0-13 with 5 minutes remaining. The Nab tagged on another point, once again from their leader Rory Grugan, their best performer on the night. But the Harps put the result beyond doubt with a goal in the first minute of injury time. A good save by Conor McGivern from a Conor Coulter shot, was deflected over the line by a Ballymacnab defender. This left the score 1-13 to 0-11 which it would remain at the final whistle. The Harps now march on to face the current Champions Maghery in what will be an interesting final. Ballymacnab’s ability to win their own kickouts – 19 out of 21, 17 were won short – gave them the perfect platform to launch their 37 attacks. Out of these 37 attacks Ballymacnab were able to have a shot at goal 24 times, converting 46% of these chances. 5 of their scores game from winning their own restarts; while they also scored once from the 5 Harps kick outs they won. The Harps won an impressive 75% of their own kick outs, which they converted to scores 4 times including the goal. However, it was their ability to turnover Ballymacnab and effectively counter-attack which led to most of their scores. 9 times they were able to score from a turnover, while having 26 turnovers throughout the game. They also converted 54% of their 26 shots from 36 attacks. Ballymacnab: Conor McGivern, Ciaran Connelly, Damien McGeown, Chris Loughran, Michael Beagan, Ryan Kennedy (0-1), Oisin McGivern, Pauric Gribben, Rory Grugan(0-7), Ruairi Gribben, Jack Grugan (0-1), Paul Kennedy (0-1), James Gray, Finnen Maguire, Brian McCone (0-1) Subs: Brendan Gribben for D. McGeown, Ryan Watters for F. Maguire, Niall McKee for R. Kennedy, Tony McKee for J. Grugan, Sean Lynch for N. McKee. Harps: Patrick Morrison, Sean Farry, Karol Loughran, Conn Stevenson, Rory McGrath, Declan McKenna (0-3), Eoin Fields, Josh Loughran (0-1), Conor White, Ryan McShane, Joe McElroy (0-2), Tommy Turley, Gareth Swift (0-3), Ultan Lennon (0-1), Charlie Vernon. Subs: Tom O’Kane (0-2) for E. Fields, Conor Coulter (1-0) for T. Turley, Simon McCoy for R. McShane, Conor Murphy (0-1) for J. McElroy, Paul Kelly for C. White, Pauric Rafferty for S. McCoy. Blood Sub: Pauric Rafferty for U. Lennon.